(Chicago, Jan. 28, 2016) – Nearly 300 primatologists from around the world are expected to gather at Lincoln Park Zoo August 18 - 20 for discussions aimed at improving chimpanzee welfare, conservation, and gaining a deeper understanding of theircomplex cognition and behavior. Chimpanzees in Context marks the 30-year anniversary of the landmark “Understanding Chimpanzees” meeting held in Chicago and co-organized by Jane Goodall and Paul Heltne, president of the then-Chicago Academy of Sciences (now the Peggy Notebaert Nature Museum). Given the success of that initial meeting, two subsequent conferences were held in Chicago, in 1991 and 2007. The synthesis of the research covered at these meetings has been published in three important volumes: Understanding Chimpanzees, Chimpanzee Cultures and The Mind of the Chimpanzee. Over the course of three days in August, Lincoln Park Zoo’s Lester E. Fisher Center for the Study and Conservation of Apes will host eight themed sessions, showcasing 40 presenters. Several world-renowned primatologists are confirmed to attend including Jane Goodall, Richard Wrangham, Frans de Waal, Tetsuro Matsuzawa and many others. Chimpanzees in Context is organized by the Fisher Center’s Steve Ross, Lydia Hopper, and David Morgan. Lincoln Park Zoo, a recognized scientific leader in chimpanzee welfare and conservation, is uniquely qualified to organize these important meetings. The zoo’s Fisher Center offers innovative training and educational opportunities for students ranging from undergraduate to postdoctoral fellowships. The core of the center’s zoo research focuses on chimpanzees and gorillas housed in Regenstein Center for African Apes and the Japanese macaques living in Regenstein Macaque Forest. Extending beyond Chicago, the zoo’s Fisher Center researchers study wild chimpanzees and gorillas living in the Goualougo Triangle, Republic of Congo, and chimpanzees living in a variety of circumstances throughout America through Project ChimpCARE. Chimpanzees in Context will be held at Lincoln Park Zoo’s Café Brauer. Conference registration is expected to sell out quickly. To learn more, visit www.chimpsymposium.org and join the conversation on Facebook and Twitter @ChimpSymp2016. Chimpanzees in Context will immediately precede the joint meeting of the International Primatological Society and the American Society of Primatologists, which is anticipated to attract be the largest ever gathering of primatologists from around the world. The joint meeting, which will be held August 21 - 27 at Navy Pier and hosted by Lincoln Park Zoo, marks the first time in history this important international primate conference has been hosted by a zoo. For more information about Lincoln Park Zoo, visit www.lpzoo.org. 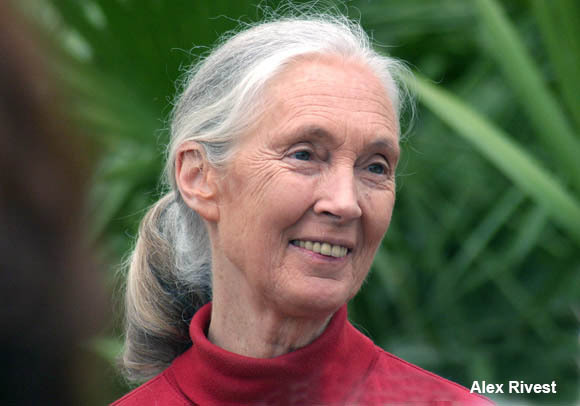 For more information about Jane Goodall and the Jane Goodall Institute, please visit www.janegoodall.org. Lincoln Park Zoo, a historic Chicago landmark founded in 1868, is dedicated to connecting people with nature by providing a free, family-oriented wildlife experience. A leader in conservation science both globally and locally, the zoo exemplifies the highest quality animal care and educational outreach. The not-for-profit zoo, managed by The Lincoln Park Zoological Society, is a member-supported organization and one of the nation’s only free, privately managed zoos. For more information, call 312 -742-2000 or visit www.lpzoo.org.